Most sales people are hired to sell but spend their time doing other things. Furthermore, most sales managers should be developing the capabilities of their team but spend too little time doing it. This seriously affects sales productivity. Huge. We are currently working with a client who is a leading global supplier of equipment for production automation. The results of their time and activity allocation survey suggest that their sales people spend no more than 50% of their time actually selling. If you think this is bad I found a recent research paper from the US based on surveys of over 1,500 sales people that found sales people typically spend only 38% of their time selling. 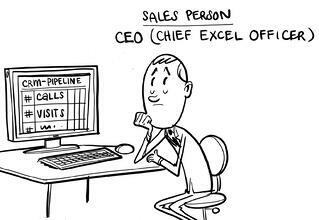 Before we look at why sales people are not doing their job let’s just think about the business case. Let’s say you have 40 sales people who only sell for 50% of the time and work an average of 50 hours per week, that’s 1,000 hours selling time per week. If you free up just 10% more time to sell that’s another 200 hours a week. The equivalent of 4 more sales people! Why aren't sales people selling? There are 2 main things that distract sales people from the job they should be doing – admin and customer service. Of course organisations want to know – need to know – what is happening in the sales funnel. But that’s no excuse for asking sales people to spend a huge amount of time entering data into systems, especially when those systems are poorly specified and designed. It is often the case that sales operations and others specify what they want from the sales management system with no regard for the time it takes out of a sales person’s selling time. The organisation needs to look objectively at what data is ‘need to have’ against what is ‘nice to have’. And if that means junking an old system and buying slimmed down software that is more flexible, accessible and useable then do the maths. Remember just 10% less time wasted in a 40 strong team is equivalent to 4 more sales people and compare that with the cost of a better system. This is a tougher challenge to resolve and needs to be tackled at an organisational level, but here is the problem. The sales person has a relationship with the customer. The sales person almost certainly wants to nurture that relationship because, as we know, happy customers are excellent sources of new business. They buy again and they recommend you to others. The downside of this is that if they are not happy, they are likely to contact the sales person who then gets drawn into trying to resolve the problem. There is a potential happy ending to this scenario when the sales person fixes the problem quickly and easily and the customer thinks even more highly of them but this is not the usual scenario. More often the sales person gets dragged into a problem that they are not trained to resolve, the customer is not happy and of course the sales person is not selling. Often sales managers are just as bogged down in fire fighting and probably even more in internal meetings and admin so they don’t have enough time to coach their sales people. Possibly the most significant issue is that senior management do not know how the sales team spend their time and often add to the issue at the same time as demanding better sales figures. The client mentioned earlier is a world leader in production automation with a large sales team working in 35 locations. The objective of their project is to increase selling time, further down the line they will work on improving sales capabilities but on the basis of up to 50% misspent time; the payback will be significant. Step 1 is to find out how sales people and sales managers spend their time now. They started with a design workshop attended by 4 successful sales people and 4 sales managers as well as the project leader. The objective was to identify what activities sales people and sales managers spend their time on currently as the basis for a company-wide survey to identify the proportion of their time they spend on each activity. The survey also identifies what activities they would like to spend more time on and what are the barriers to doing so, along with identifying what they would like to spend less time doing and what prevents them from doing so. We raised a big red flag when the participants put activities like Opportunity Reviews and Win/Loss Analysis in the category “Internal Admin”. Unless individuals and the team are constantly looking at the way they work and what is effective the risk is performance will drop as mistakes are repeated and bad habits become ingrained. The survey will be tested by a group of 20 sales people and 10 sales managers before being rolled out globally. The results will give a clear view of just how the sales team is spending their time and some clear insights into why they are not spending more of it selling. The analysis will also show the differences between how successful (and less successful) sales people and sales managers spend their time. Based on this transparency you can look at the best ways to get sales people back to selling. Once they are spending more time selling you can look to provide training that will improve their performance while they are actively selling. The training will be more effective because it will affect a greater number of hours per person trained. Do you know how your sales people spend their time? How well are salespeople’s activities aligned with their goals e.g. to win more new customers? What obstacles prevent salespeople spending more time on selling? What prevents sales managers from spending more time on developing their team?